Ubiquiti UniFi Access Points's are ideal for the deployment of high-performance wireless networks, providing reliable performance and scalability for indoor and outdoor WiFi. UniFi AP devices can easily be managed through the UniFi Controller Software, with powerful management of remote sites all within a single unified software controller. UniFi AP is the ideal choice for Enterprise and SME's looking for a unified WiFi and networking solution. The UniFi AC Pro AP features the latest Wi-Fi 802.11ac, 3x3 MIMO technology in a refined industrial design and is ideal for deployment of maximum performance wireless networks. The UniFi AC Pro AP is a gigabit, 802.3af powered access point suitable for indoor or outdoor use. The UniFi Controller v4 software is a powerful, enterprise wireless software engine ideal for high-density client deployments requiring low latency and high uptime performance. With its software-based capabilities, the UniFi virtual control plane allows for unlimited scalability under one centralised controller. Remotely access the UniFi Controller to upgrade deployed UniFi APs while in the field. The UniFi AC Lite AP features the latest Wi-Fi 802.11ac technology in a refined industrial design and is ideal for cost-effective deployment of high-performance wireless networks. The UniFi AC Lite AP features a cleaner design in a reduced footprint - half the size compared to the standard UniFi AP. 802.3at PoE+ 802.3at PoE+ Ceiling Mount Wall Mount Wireless Uplink DFS Certification Dimensions(mm) 140 x 87 x26 140 x 87 x26 ∅160 x 31.5 ∅176 x 43 ∅197 x 35 ∅220 x 48 5-Pack Buy Buy Buy Buy Buy Buy * Please note that the multi-pack does not include PoE adapters. 802.11ac Wave 2 MU-MIMO (Multi-User, Multiple Input, Multiple Output) technology allows a Wave 2 AP to communicate with multiple clients at the same time - significantly increasing multi-user throughput and overall user experience. Independent 2.4 GHz and 5 GHz dedicated hardware offload for maximised multi-user throughput and reduced latency Dedicated hardware offload for QoS, Guest Control, and Client Management Antenna System Optimised for 802.11ac Wave 2 MU-MIMO Beamforming Data is sent and received using multiple antennas to increase throughput and range. The UniFi® Ecosystem enables the system integrator to effectively and efficiently create wireless network designs of any size, from small to large, with the potential for unlimited scalability. The built-in, dedicated security and monitoring radios of the UniFi SHD (Secure High Density) AP provides visibility into site performance, channel planning, and local interferers, allowing the integrator to properly evaluate performance and quickly respond to changing interference and security threat landscapes. Easily accessible through any standard web browser and the UniFi app (iOS or Android™), the UniFi Controller software is a powerful software engine ideal for highdensity client deployments requiring low latency and high uptime performance. UniFi® is the revolutionary Wi-Fi system that combines enterprise performance, unlimited scalability, and a central management controller. The UniFi nanoHD AP has a refined industrial design and can be easily installed using the included mounting hardware. The UniFi nanoHD AP is the UniFi 802.11ac Wave 2 AP with the smallest form factor. Combining the performance increases from MU-MIMO technology and the use of 4x4 spatial streams, the UniFi nanoHD AP delivers up to 125% greater performance1 than a typical Wave 1 AP. Ubiquiti's Smallest UniFi Access Point Available On the Market. UAP nanoHD is 30% smaller than UAP AC Pro version. Easily deploy your UniFi Enterprise System using the included UniFi Controller software. Manage thousands of UniFi devices across multiple sites, and scale your network as needed without any ongoing licensing fees. UniFi is the revolutionary Wi-Fi system that combines enterprise performance, unlimited scalability, and a central management controller. The UniFi AC Mesh APs have a refined industrial design and can be easily installed using the included mounting hardware. Wire a workstation and power a VoIP phone. Or power a US-8 for even more Ethernet ports. Ideal for new and retrofit installations, the UniFi® AC In-Wall is designed to convert an Ethernet wall jack into a dual-band 802.11ac Wi-Fi access point with two Gigabit Ethernet ports. Keep track of all of your network security with constant reporting. 24V Passive PoE PoE Passthrough * Ceiling Mount Wall Mount Wireless Uplink DFS Certification Dimensions(mm) 140x87x26 140x87x26 140x87x26 ∅ 160x32.5 ∅ 176x43 ∅ 197x35 Buy Buy Buy Buy Buy Buy * Requires PoE 802.3at PoE+ switch. Featuring Wi-Fi 802.11ac, 3x3 MIMO technology and a sleek industrial design, the UniFi AP-AC is a Ubiquiti Networks Access Point (AP), ideal for deployment of high-performance wireless networks. 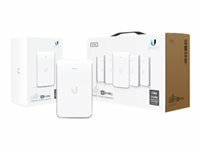 The UniFi AC In-Wall Pro AP transforms an Ethernet wall connection into a simultaneous, dual-band 802.11AC Wi-Fi Access Point with 3x3 MIMO technology and 50% higher radio rates than the UAP-AC-IW. 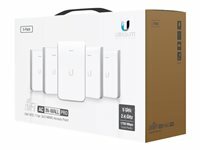 The UniFi AC In-Wall Pro features two Gigabit Ethernet ports, one of which delivers PoE to power and connects an 802.3af device to the network.. Easier than you think Ideal for new and retrofit installations, the UniFi AC in-wall is designed to convert an Ethernet wall jack into a dual-band 802.11ac Wi-Fi access point with two Gigabit Ethernet ports. Versatile data and PoE output An Ethernet wall jack becomes an access point, a gigabit switch, and a PoE power source. Wire a workstation and power a VoIP phone. Or power a US-8 for even more Ethernet ports. Simple and scalable device management The UniFi controller provides a graphical user interface for easy configuration and monitoring of the UniFi Switch and other UniFi devices. Easily accessible through any standard web browser and the UniFi app (iOS or Android™), the UniFi Controller software is a powerful software engine ideal for high-density client deployments requiring low latency and high uptime performance. The UniFi IW HD AP is capable of complex operations (guest control, filtering, and other resource-intensive tasks) that may slow down a lesser-equipped AP. The UniFi IW HD AP can be conveniently powered by an 802.3af or 802.at compliant switch. We recommend powering your UniFi devices with a UniFi PoE Switch. The UniFi IW HD AP has a refined industrial design and can be easily installed using the included mounting hardware. The UniFi® Ecosystem enables the system integrator to effectively and efficiently create wireless network designs of any size, from small to large, with the potential for unlimited scalability. The built-in, dedicated security and monitoring radio of the UniFi XG AP provides visibility into site performance, channel planning, and local interferers, allowing the integrator to properly evaluate performance and quickly respond to changing interference and security threat landscapes. The UniFi XG AP features the latest in Wi-Fi 802.11ac Wave 2 MU-MIMO technology combined with dedicated security and Bluetooth radios. The system integrator can start with one and expand to thousands while maintaining a single unified management system. The UniFi WiFi AP delivers unprecedented wireless awareness and security, including tools for real-time spectrum monitoring, airtime utilisation analytics, and intrusion detection/prevention. Using a persistent spectral scan, the AP constantly monitors the RF environment to check for both potential malicious activity and the best channel for network performance. Please note: A PoE injector is not included with this device and must be bought separately. The UAP-PRO supports speeds of up to 300 Mbps in the 5 GHz radio band and up to 450 Mbps in the 2.4 GHz radio band. The UAP-PRO offers simultaneous dual-band operation with 2x2 and 3x3 MIMO technology. It has a range of up to 122 m (400 ft) and two Gigabit Ethernet ports. UniFi is a revolutionary Wi-Fi system which combines carrier class performance, unlimited scalability, disruptive pricing, and a virtual management controller. Simultaneous Dual-Band - The UniFi®AP-PRO supports up to 300 Mbps, 2x2 MIMO for the 5 GHz band and up to 450 Mbps, 3x3 MIMO for the 2.4 GHz band. Wi-FiScalability for Thousands. - With its software-based capabilities, the UniFi®virtual control plane allows for unlimited scalability under one centralized controller. Rapid Deployment. - Plug and Play installation and intuitive management reduce the need for dedicated IT personnel resources. No Software Fees. - The UniFi®Controller software is bundled with the UniFi AP hardware at no extra charge — no separate software, licensing or support fee. Easy Mounting - Sleek wall or ceiling mount design (all accessories included). Design - Aesthetic industrial design with a unique LED provisioning ring or square, which provides administrator location tracking and alerts for each device. Power over Ethernet (PoE) - Includes Power over Ethernet (PoE) functionality, which allows both power and data to be carried over a single Ethernet cable to the device. Each UniFi model includes a Power over Ethernet adapter and it can also be powered by the Ubiquiti TOUGHSwitch PoE PRO (sold separately). The UniFi AP-PRO is compatible with an 802.3af compliant switch. Create one large wireless network across multiple APs so users can roam and seamlessly maintain their connection as they switch to the nearest AP. The UniFi EDU mobile app is now available in the App Store for iOS and Google Play Store for Android. The Unifi AC EDU AP supports simultaneous dual-band, 3x3 MIMO technology in the 2.4 and 5 GHz radio bands for up to 1750 Mbps. Broadcast announcements with clarity from your iOS or Android-based device using our UniFi Broadcast app. The UAP-LR has a longer range than the base model UAP with a range of up to 183 m (600 ft). It also offers 802.11n MIMO, with speeds of up to 300 Mbps. UniFi is a revolutionary Wi-Fi system which combines carrier class performance, unlimited scalability, disruptive pricing, and a virtual management controller. UniFi Access Points feature the latest in Wi-Fi 802.11n MIMO technology - capable of 300 Mbps speeds with ranges up to 500 ft.
Scalability for Thousands. - With its software-based capabilities, the UniFi®virtual control plane allows for unlimited scalability under one centralized controller. Amazing Long-Range Links - The UniFi®AP-LR offers a longer range – up to 183m – than the base model UniFi AP or UniFi AP-PRO.